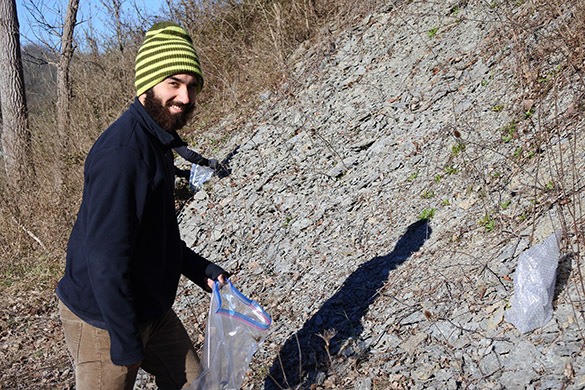 Earlier this month, Luke Kosowatz, Matt Shearer and I went on a field trip through the Cincinnati region collecting Upper Ordovician (Katian) bryozoans and examples of bioerosion for their Independent Study projects and other investigations. I picked up the above slab and put it in our vehicle for future study not because of its beauty, but the preservational modes it displays. The black, rounded objects are bivalves, probably of the Order Modiomorphida. 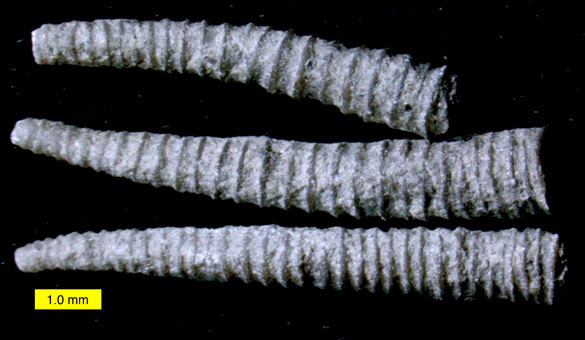 They are miserable fossils to identify because they originally had shells made of the mineral aragonite, which dissolved quickly after the animals died. What is left are a few scrappy molds and that black film. 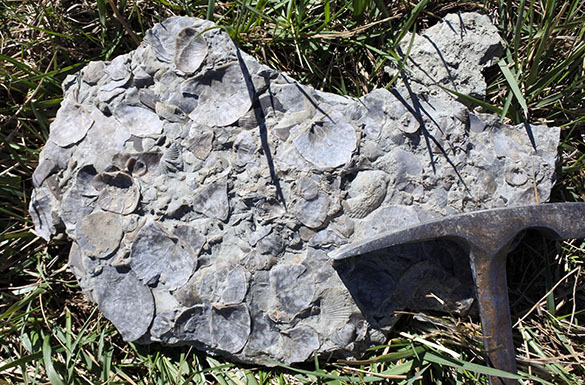 This is a common preservation of bivalves in the Cincinnatian. 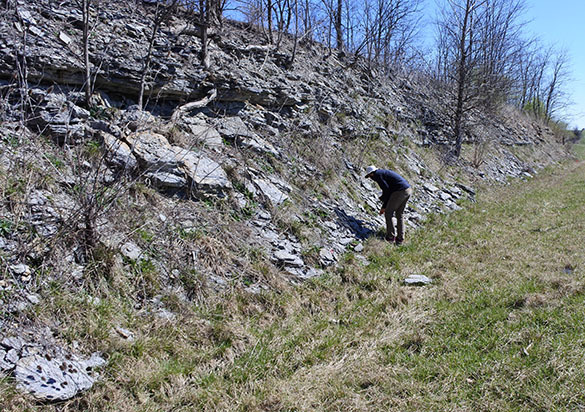 This is the Corryville Formation outcrop from which the slab came. 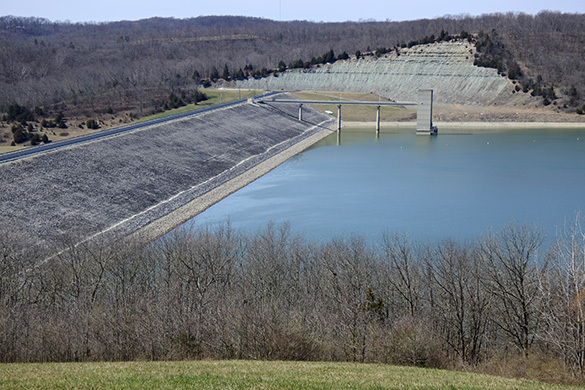 It is just west of Maysville, Kentucky, along the AA Highway (N 38.60750°, W 83.76775°; C/W-740). Here is the slab along the roadside before we cleaned it up. Not much to see, really, except the low-relief black blobs that are remains of bivalves. As you see, not much detail in the bivalves other than an outline matching somewhat the modiomorphids. Those of you with sharp paleontological eyes will note a round gray patch with radiating lines. This is a bryozoan that was attached to the bivalve shell. When the shell dissolved, the bryozoan attachment surface became visible. In other words, this is an upside-down encrusting bryozoan, a condition we’ve seen several times in this blog. Here’s another bivalve with an upside-down encrusting bryozoan. This time you can see that the black film was underneath the bryozoan and on the outside of the bivalve shell. 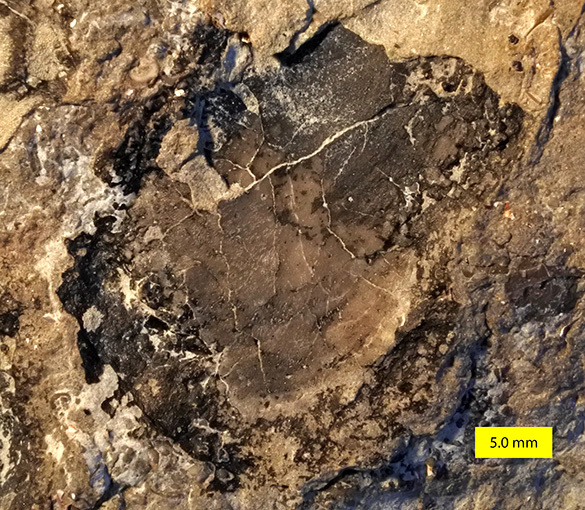 In a 2004 paper, Tim Palmer and I wrote: “We have also long been curious about why some of the epifaunal aragonitic Ordovician genera in the Cincinnatian such as Modiolopsis are preserved with a thick black outer shell covering (e.g. Pojeta 1971, pl. 15, fig. 6). It now seems likely that this was a hypertrophied periostracum that conferred some protection against dissolution during life, similar to the situation seen in Recent unionids that are susceptible to dissolution in their fresh-water habitats” (p. 425). Maybe it’s time we followed up on these speculations? I’m sure other paleontologists have had similar ideas. Among the indistinct modiomorphid bivalves is this old friend: Ambonychia with its characteristic radiating ridges. Palmer, T.J. and Wilson, M.A. 2004. 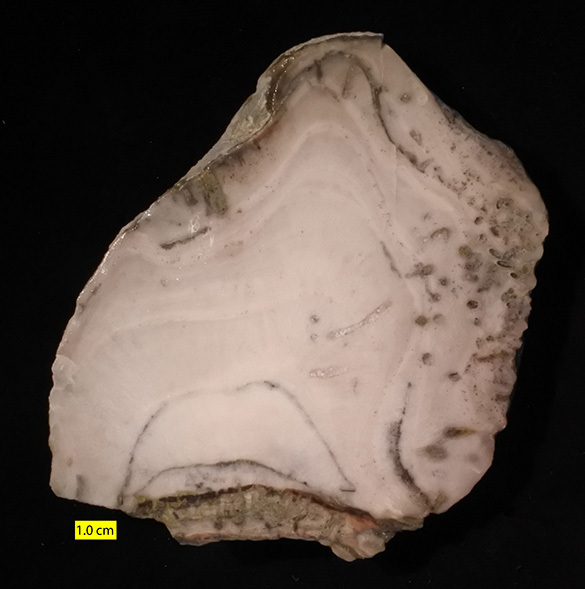 Calcite precipitation and dissolution of biogenic aragonite in shallow Ordovician calcite seas. Lethaia 37: 417-427. Pojeta, J. 1971. Review of Ordovician pelecypods. United States Geological Survey, Professional Paper 695, 1-46. Climate Change 2017 is pleased to have been asked to date the Tracy House, Apple Creek Ohio. The log house/cabin is now stored in the soon to be Apple Creek Community Center and Library will be reassembled this coming summer. The date is unambiguous and most of the timber was cut after the growing season of 1826 and it is likely that the house was originally constructed in 1827, one of the first to be built in the East Union Township. A copy of our report can be found here. The class cores an old growth living tree to help assemble a calendar dated tree ring chronology. Graph showing an 100 year overlap between the North East Ohio (NEO) living ring-width chronology and the ring-width chronology from the Tracy House. For the full 230 year period of overlap the correlation is 0.75 – pretty impressive, it shows the power of tree-ring dating and the sensitivity of white oak to climate in Ohio. To learn more about the utility of this data view this. The group resting after work on a 70 degree F day in February at Browns Lake Bog where they cored some of the remnant old growth oak stands of Northeast Ohio (above). The group getting the run down at Apple Creek (below). 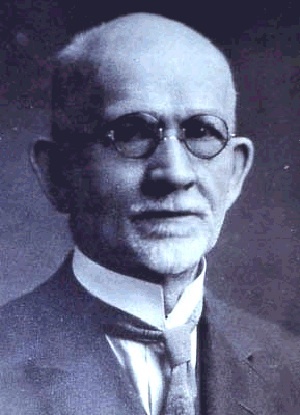 Bauer, J.E. and Stigall, A.L. 2016. A combined morphometric and phylogenetic revision of the Late Ordovician brachiopod genera Eochonetes and Thaerodonta. Journal of Paleontology 90: 888-909. It does classic systematics on a group of brachiopods with the modern tools of morphometric and phylogenetic analyses. Its conclusions are direct and convincing: The genus Thaerodonta is synonymous with Eochonetes, and a variety of species are shifted around, solving problems that have lingered for over a century, Plus as a bonus, who can’t love a new species named Eochonetes voldemortus? So I set out to find specimens of this brachiopod group in our collections. Above are internal valve views of the brachiopod Eochonetes clarksvillensis (Foerste, 1912), showing characteristic denticles (little teeth) along the hinge line. Below are external valve views. Jen Bauer herself kindly confirmed the identifications! These specimens come from the Waynesville Formation (Katian) exposed at Caesar Creek in southern Ohio, a place we have had many paleontology field trips. 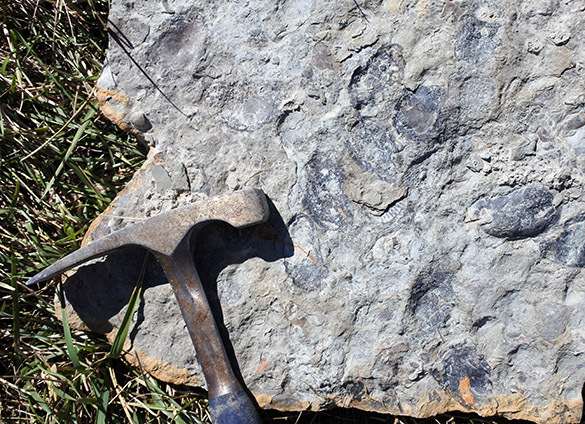 E. clarksvillensis is common in the Waynesville and overlying Liberty formations. Read much more about it in Bauer and Stigall (2016). 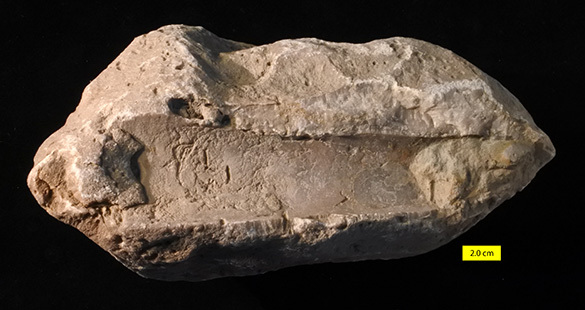 The genus Eochonetes was named by Frederick Richard Cowper Reed in 1917 from the Ordovician of Scotland. (The British Isles were not too far away from Ohio in the Late Ordovician.) Reed was born in London in 1869 and died in Cambridge, England, in 1946. I tried mightily but could find no images of him to enter into the digital archives of the web. He was a smart and diverse geologist, attending Trinity College, Cambridge, and winning important awards and scholarships. He was appointed assistant to the Woodwardian Professor of Geology at Cambridge in 1892, a position he kept until retirement. In 1901 he earned the Sedgwick Prize for his work on the rivers of East Yorkshire, wrote a book on the geology of the British Empire (much easier to do today! ), and yet still found time to describe fossils in numerous papers. 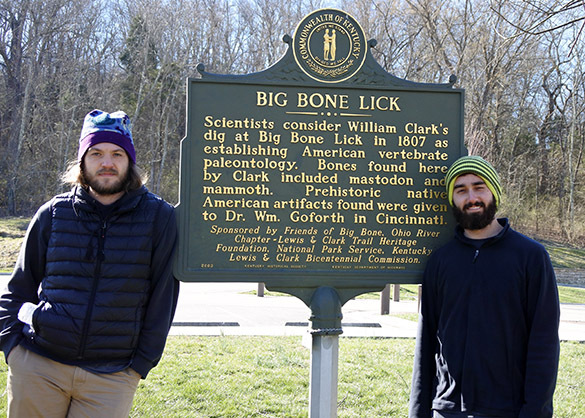 The author of Eochonetes clarksvillensis is much better known to paleontologists of the Cincinnati region. It is August F. Foerste (1862-1936), who named Thaerodonta clarksvillensis in 1912. Foerste grew up and worked in the Dayton, Ohio, area, graduating from Denison University after publishing many papers as a student. He returned to Dayton after earning a PhD from Harvard, teaching high school for 38 years. When he retired he turned down a teaching position at the University of Chicago and instead worked at the Smithsonian Institution until the end of his life. 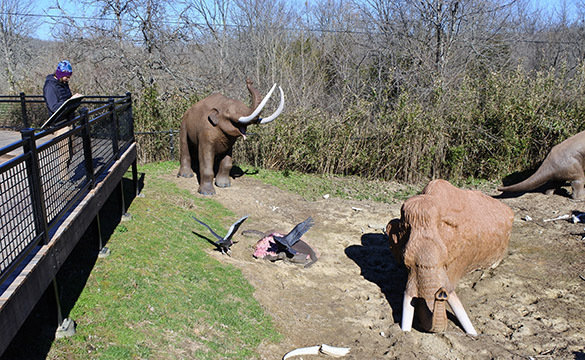 He is one of the giants of the Cincinnati School of paleontology. Reed, F.R.C. 1917. 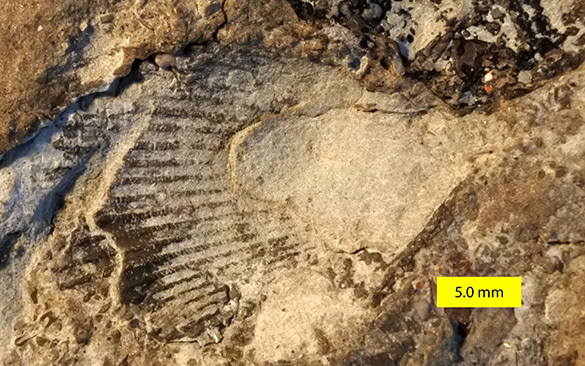 The Ordovician and Silurian Brachiopoda of the Girvan District: Transactions of the Royal Society of Edinburgh 51: 795–998. This massive trepostome bryozoan, a solid lump of biogenic calcite, was collected earlier this week on the latest Team Cincinnati field expedition into the treasure-filled Upper Ordovician underlying and surrounding that city. 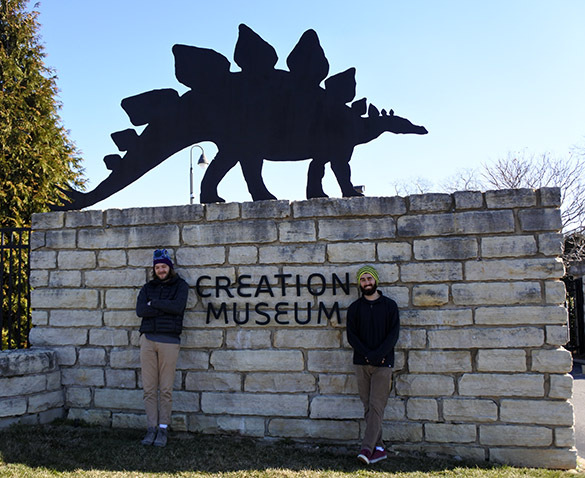 Wooster students Matt Shearer, Luke Kosowatz and I are pursuing projects related to trepostome bryozoans and bioerosion (the biological destruction of hard substrates). The above specimen combines both these worlds, and more. Note the concavity at the base of the specimen. 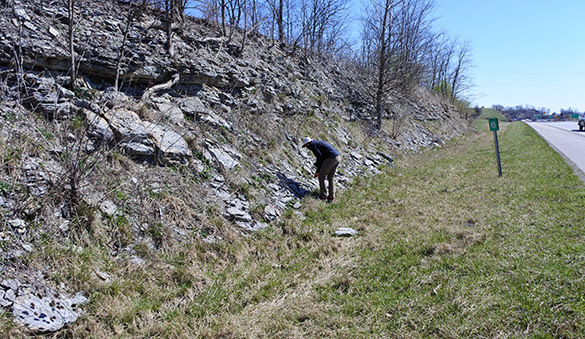 It comes from the Bellevue Formation (Katian) exposed on Bullitsville Road near the infamous Creation Museum (C/W-152). 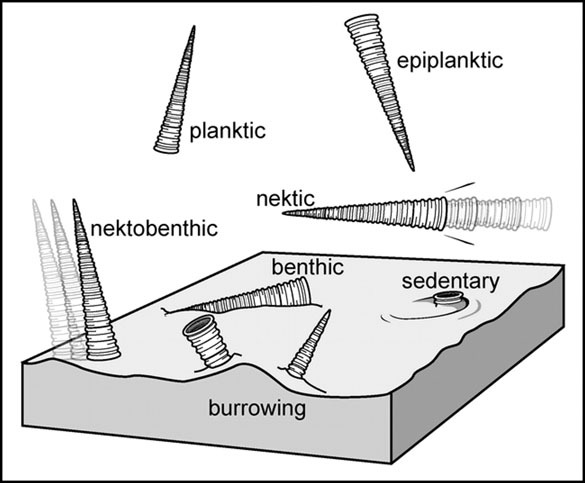 Underneath the bryozoan colony (its zoarium) is this conical impression. It is an external mold of a straight nautiloid conch, the shell of a common squid-like cephalopod during the Ordovician. After the death of the nautiloid its empty tubular conch rested on the seafloor. This hard surface attracted the larvae of a variety of bryozoans that spread their calcitic zoaria (colonial skeletons) across the surface. Eventually one trepostome bryozoan species gained dominance over the space and occupied it all, growing into the large colony we see today. It even wrapped around the aperture of the conch (on the left) and grew a bit into the tube. Since the nautiloid conch was made of unstable aragonite, it long ago dissolved away, leaving an impression (external mold) in the stable calcite of the bryozoan. How do we know there were earlier generations of bryozoans on this conch? 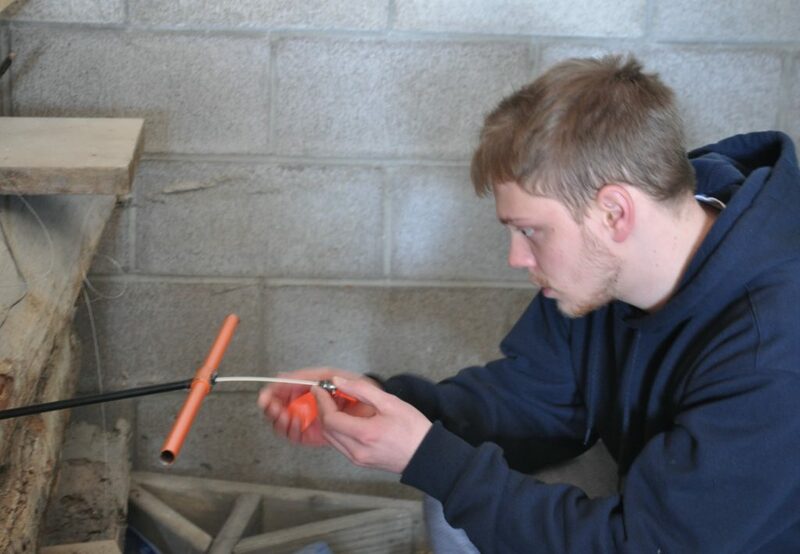 We see them exposed upside-down on the surface of the external mold. Above we see the thin, branching cyclostome bryozoan Cuffeyella in the foreground, with a sheet of an encrusting trepostome bryozoan in the background. There are several other earlier bryozoans visible on this surface, revealing an ecological succession. 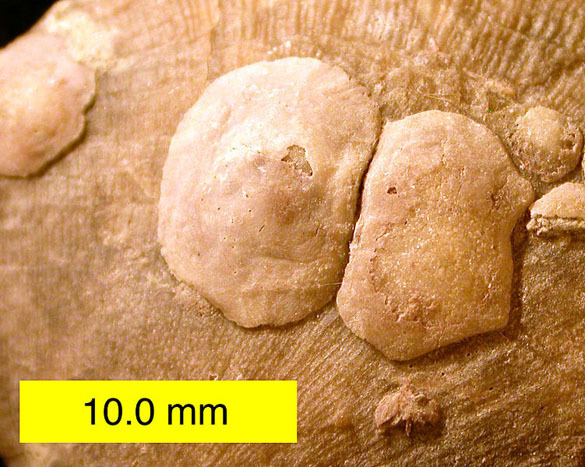 There may be soft-bodied organisms preserved on this surface as well. This locality yielded the first described specimens of bioimmuration in the Ordovician (see Wilson et al., 1994). 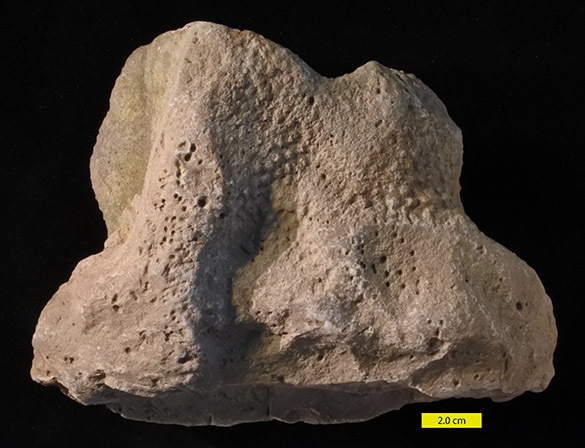 There were other large trepostome bryozoans found in this same locality. I couldn’t resist cutting one in half to see what the inside looked like. 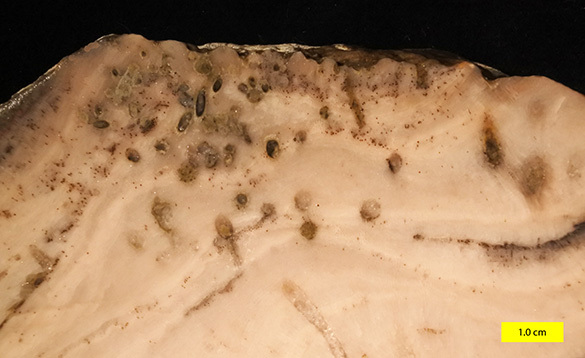 In this close view of the cross-section through the calcitic trepostome bryozoan we see numerous round holes drilled by some sort of worm seeking protective space so it could filter-feed. (In other words, it was not preying on the bryozoan.) The most intense boring of the specimen appears to have taken place just before and after the death of the colony. We know some borings were excavated into living bryozoan skeleton because the bryozoan formed reactive tissue around the intruder. 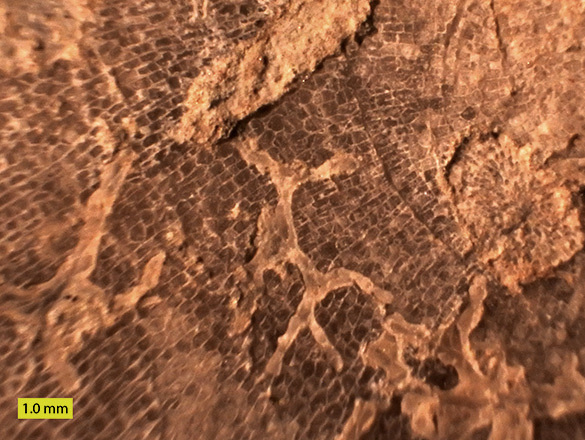 The very tiny reddish-brown dots scattered in layers are “brown bodies“, the organic remnants of bryozoan polypides in their skeletal tubes (zooecia). 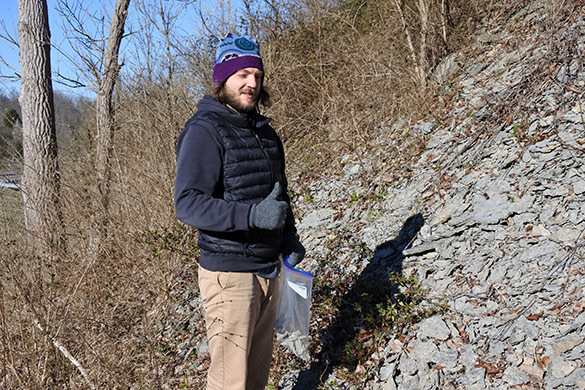 It has been a pleasure to return to the extraordinary Cincinnati fossils! 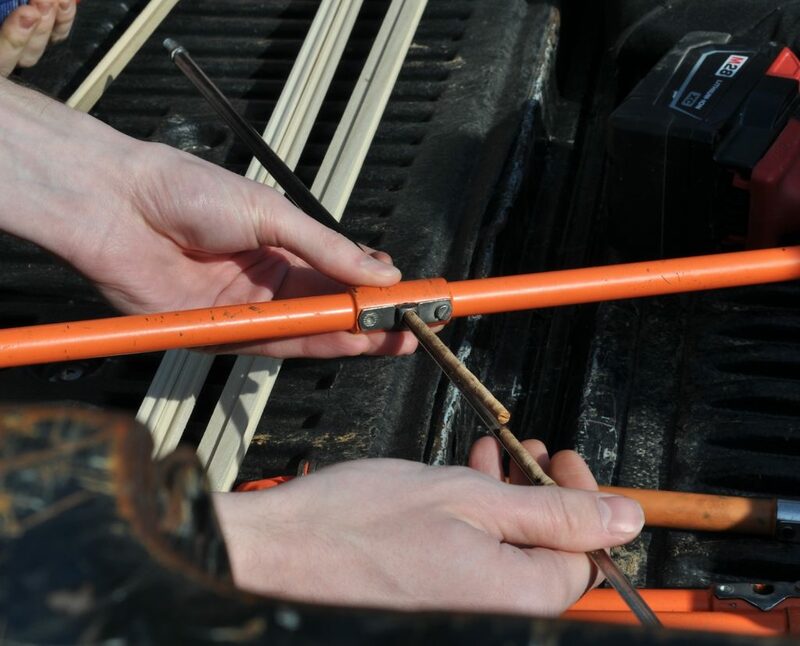 Wooster, Ohio — Matthew, Mark and Luke (if only we had a John!) left the field a day early, hightailing it from Maysville, Kentucky, to Wooster today before a large storm system brought snow, ice and freezing rain (delightfully called a “wintry mix”). 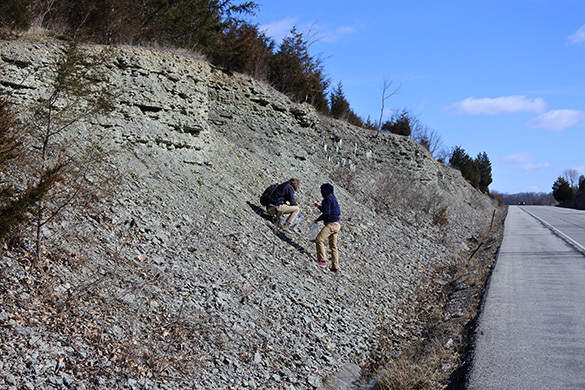 We made a couple of stops in the Whitewater Formation near West Union, Ohio, but did not collect because we couldn’t be sure of the stratigraphic context of loose specimens. On the way back north we visited the Serpent Mound National Historic Landmark near Peebles, Ohio. 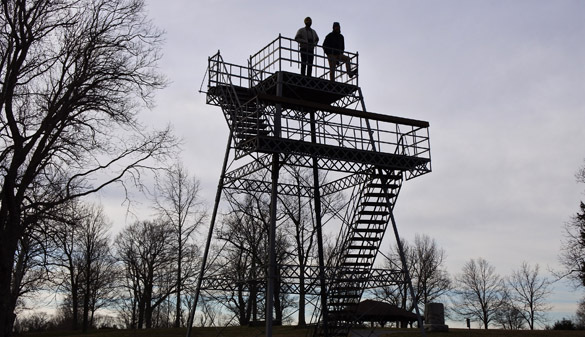 Matt and Luke are shown above freezing on the observation tower early in the morning. Not surprisingly, we had the place to ourselves. 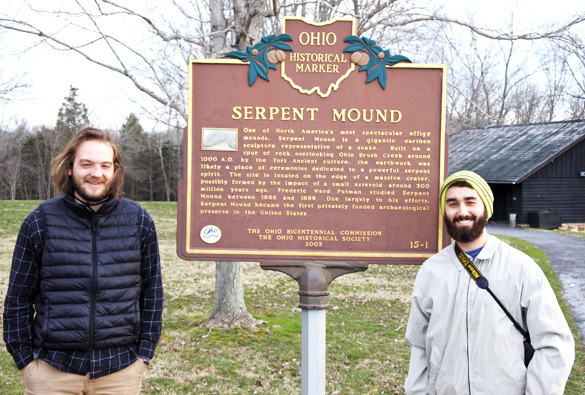 Luke and Matt at the state marker for Serpent Mound. 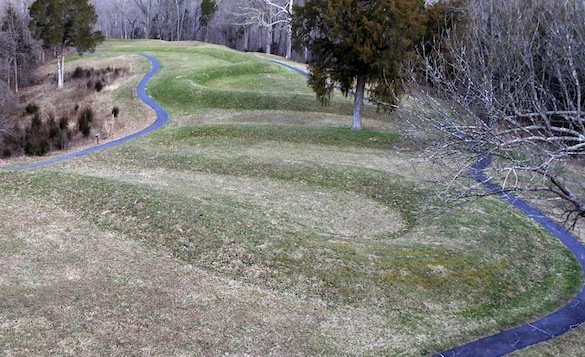 There is no vantage on the ground from which you can see the entire serpent effigy mound. This is the view from the tower looking across the body towards the head. Above is the coiled tail. There is considerable debate about when this elaborate mound was constructed. Some radiocarbon dating places it at around 300 BCE, therefore built by the Adena people. Other dating indicates it was made about 1070 CE by the Fort Ancient culture. The site is on an ancient (very ancient — Permian!) meteorite impact crater, an astrobleme. No evidence of this structure is directly visible at the site, but a geological survey of the bedrock shows incredible disruption. 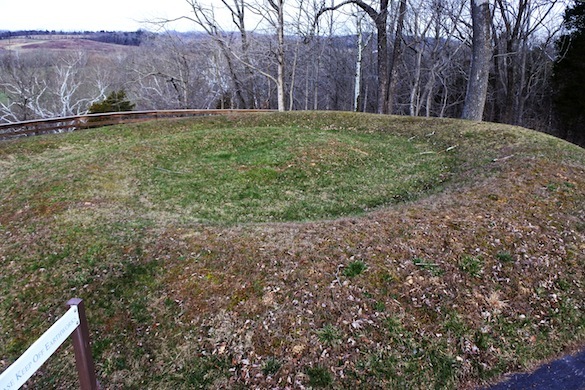 The late Dr. Frank Koucky, a geology professor at The College of Wooster, did considerable research on what was then known as the Serpent Mound Cryptoexplosion Structure. I had many field trips here with him as a student. This is the storm we escaped late today. 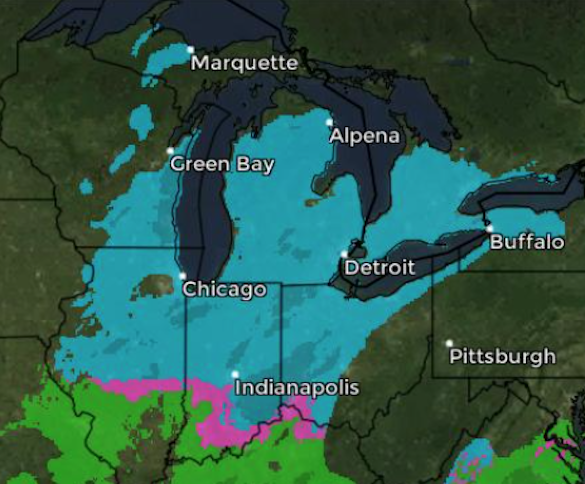 Our field areas are essentially in the pink wintry mix belt. 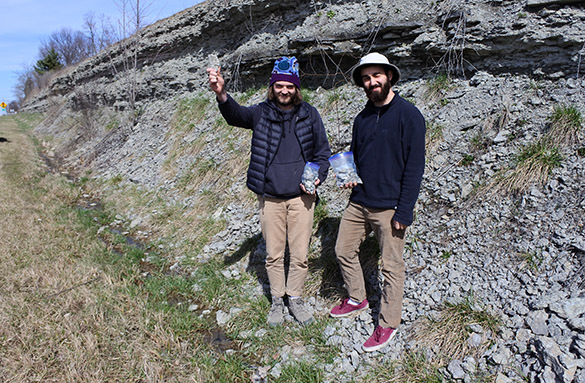 We would have ended the trip early in any case, though, because Matt and Luke were such efficient field paleontologists that they filled all our available boxes with fossils (see below) and we visited all the critical sites we needed. Luke now drives to his home in New Jersey, and Matt drives home to California. 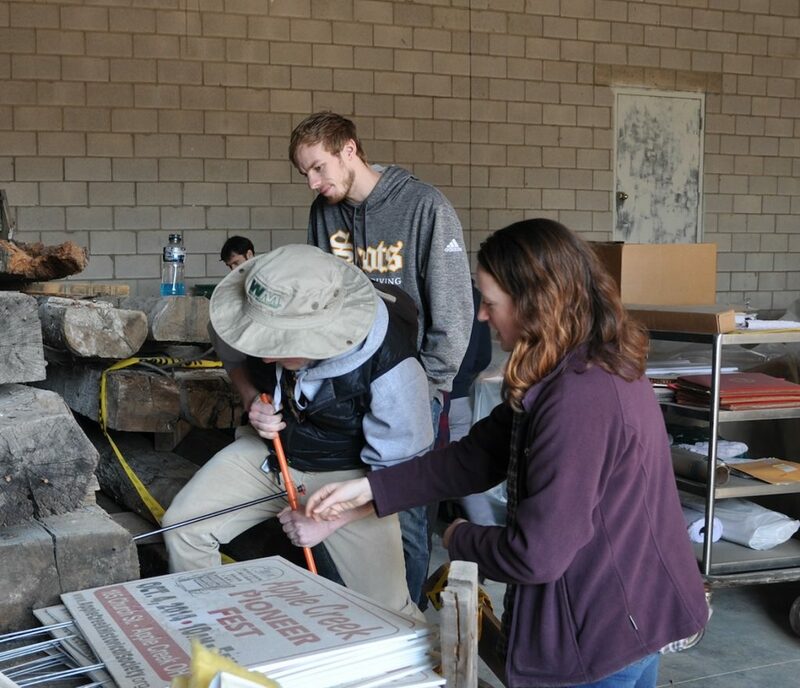 Their labwork will begin when they return to campus from Spring Break. More details on their projects and discoveries then! Team Cincinnati’s fossils ready to be unpacked, washed, sorted and studied. 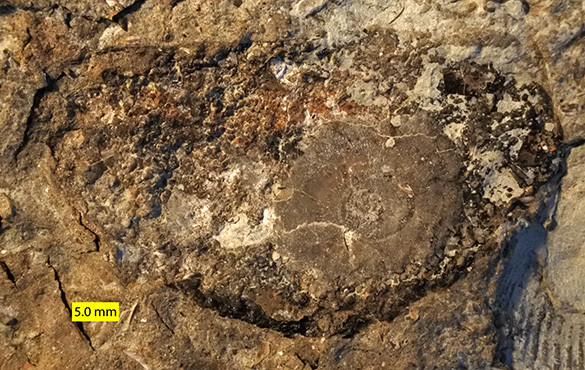 The two irregular patches above are brachiopods known as Petrocrania scabiosa encrusting the ventral valve of yet another brachiopod (Rafinesquina). That species name “scabiosa” is evocative if not a little unpleasant — it is also the root of the English “scab”. Petrocrania scabiosa is in a group of brachiopods we used to call “inarticulates” because their two valves are not articulated by a hinge as they are in most brachiopods. Instead they are held together by a complex set of muscles. Now we place these brachiopods in the Class Craniforma, an ancient group which originated in the Cambrian and is still alive today. Petrocrania scabiosa was a filter-feeder like all other brachiopods, extracting nutrients from the seawater with a fleshy lophophore. 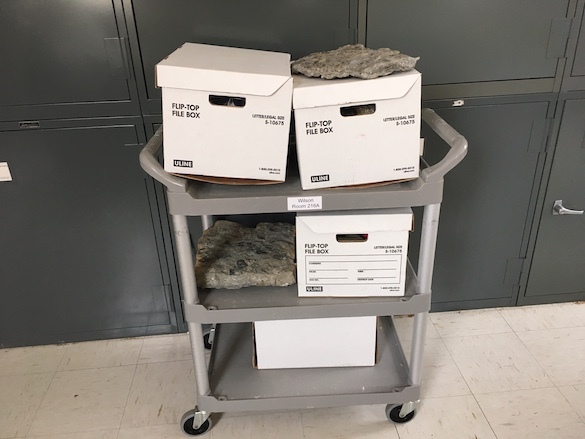 The Wooster specimens are part of our large set of encrusting fossils (a type of sclerobiont) in our hard substrate collection. They have irregular shells that are circular in outline when they grew alone, and angular when they grew against each other. 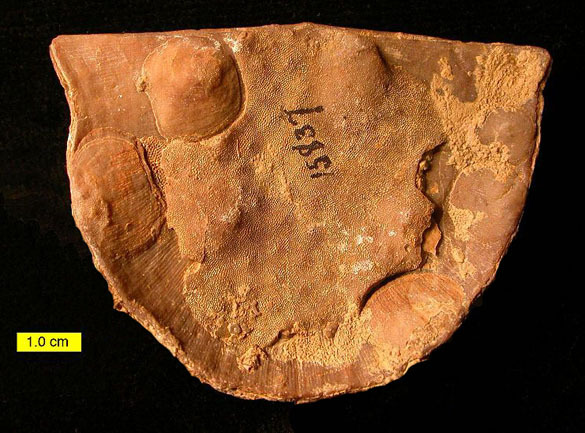 Some craniid brachiopods were so thin that their shells repeated the features of the substrate underneath them, a phenomenon known as xenomorphism (“foreign-form”). Petrocrania scabiosa brachiopods (circular) on a Rafinesquina brachiopod, along with a trepostome bryozoan that encrusted some brachiopods and grew around others. The P. scabiosa on the far left shows xenomorphic features. Specimen borrowed from the University of Cincinnati paleontology collections. 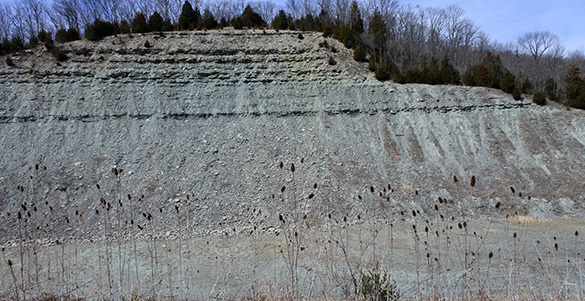 A 2007 College of Wooster paleontology field trip to the Upper Ordovician locality near Richmond, Indiana, where these specimens were found. Students are in the traditional paleontological poses. 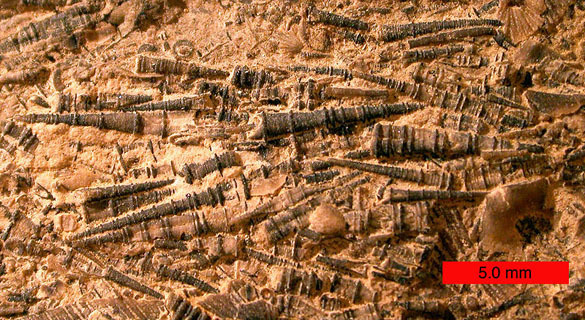 The sharp little conical fossils above are common Paleozoic fossils, especially in the Devonian. They are tentaculitids now most commonly placed in the Class Tentaculitoidea Ljashenko 1957. Tentaculitids appeared in the Ordovician and disappeared sometime around the end of the Carboniferous and beginning of the Permian. 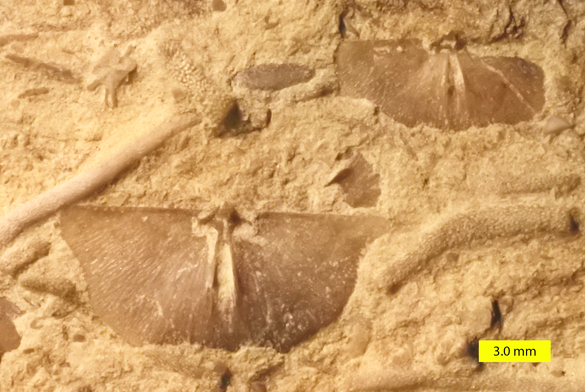 These specimens are from the Devonian of Maryland. The systematic placement of the tentaculitids has been controversial. Their straight, narrow shells are usually ornamented by concentric rings, and many had septa (thin shelly partitions) inside the cones. The microstructure of the shells is most interesting — it looks very much like that of brachiopods and bryozoans. For this reason and several others, several of my colleagues and I believe the tentaculitids were lophophorates (animals that filter-feed with a tentacular device called a lophophore). They may thus be related to other problematic tubeworms like microconchids and cornulitids (Taylor et al., 2010). 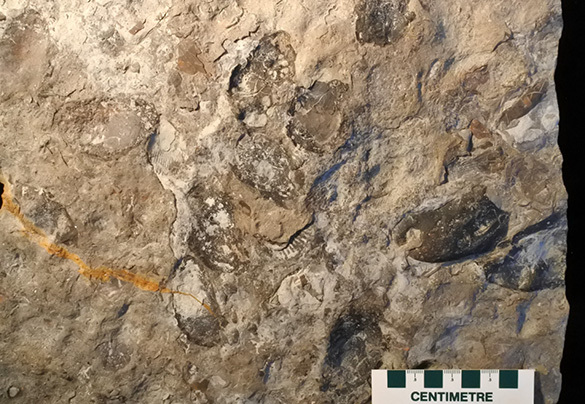 Tentaculitids from the New Creek Limestone (Lochkovian, Early Devonian) of New Creek, West Virginia. Knowing how the tentaculitids fit into an evolutionary scheme, though, has not helped us figure out what they did for a living. The figure below, from Cornell et al. (2003), shows these funny cones in just about every lifestyle imaginable! Cornell, S.R., Brett, C.E. and Sumrall, C.D. 2003. 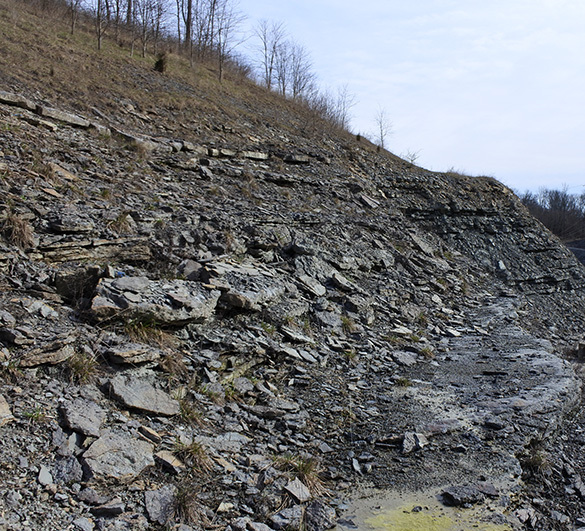 Paleoecology and taphonomy of an edrioasteroid-dominated hardground association from tentaculitid limestones in the Early Devonian of New York: A Paleozoic rocky peritidal community. Palaios 18: 212-224. One of the pleasures of being in the Geology Department at The College of Wooster is that we have the annual Richard G. Osgood, Jr., Memorial Lecture series. These presentations, given in honor of the late Professor Osgood, have significantly enriched our intellectual lives. 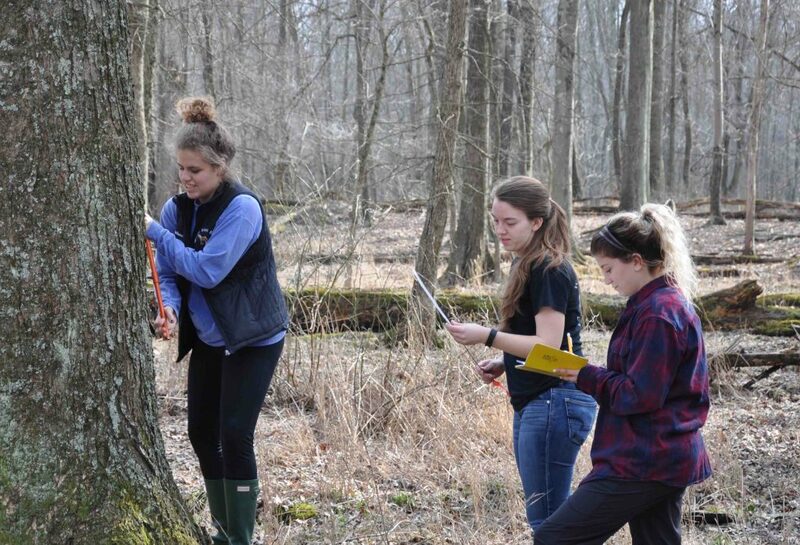 Funds from the endowment are used to bring to Wooster internationally-recognized Earth scientists. 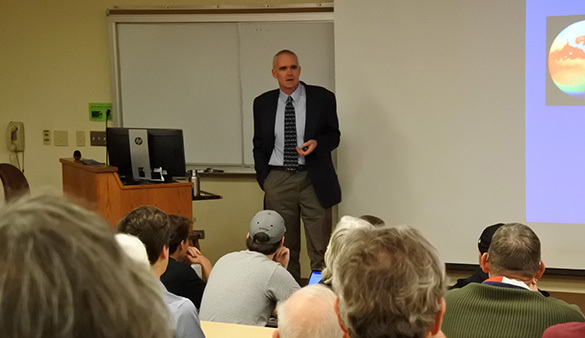 Last night the 36th Osgood Lecture had an overflow crowd in Lean Lecture Room. It was an excellent event in every way. Our speaker was Dr. 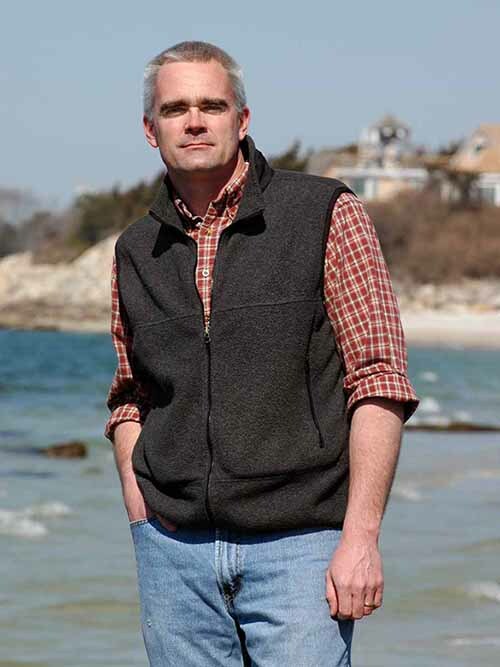 Rob Thieler, Director of the U.S. Geological Survey Coastal and Marine Science Center. His title was “Changing Climate, Changing Coasts”. 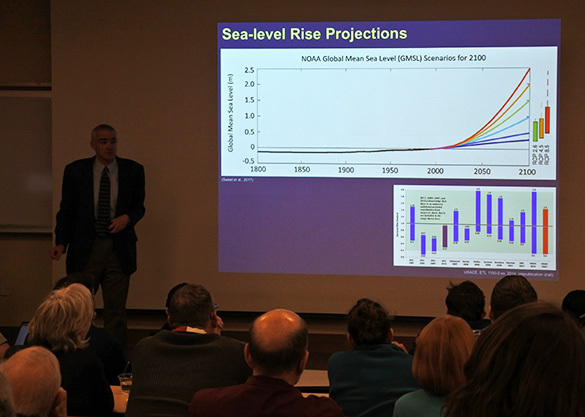 Dr. Thieler outlined the causes and consequences of sea-level rise on coastal systems. It is a complex topic, but he made it accessible to everyone. The projected changes are grim enough, but he emphasized to students the critical need now and in the future for people who can communicate science effectively to the public, and for decision-makers to have strong foundational awareness of geological context. Sounds like the ideal mission for a liberal arts geology program. Dr. Rob Thieler on, appropriately, a coastline. We thank him for his clear, provocative and information-rich talk, and his wonderful interactions with our students. Thank you again to the Osgood family for endowing this spectacular lecture series.